You must be an administrators or user manager to create user accounts. User managers cannot create administrator accounts. A company account can have up to 7,500 users. 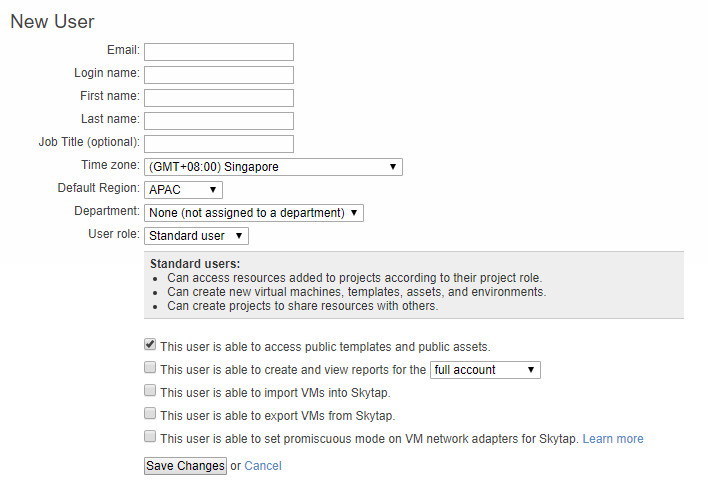 For an overview of Skytap user roles and access permissions, see User roles and access permissions. If the Admin button isn’t visible, your account doesn’t have administrator permissions. Click New User. The New User page displays. (Optional) If your account is enabled for single sign-on, an Enable Single Sign-on option appears. To validate the user’s login via SSO, click Enable Single Sign-on; to use standard password-based authentication, leave this option unchecked. A valid Email address. Users receive important emails, including browser activation links and usage notifications. A unique Login name (by default, the email address provided above). If you are using SSO, the login name must be a valid email address. A Department (optional). 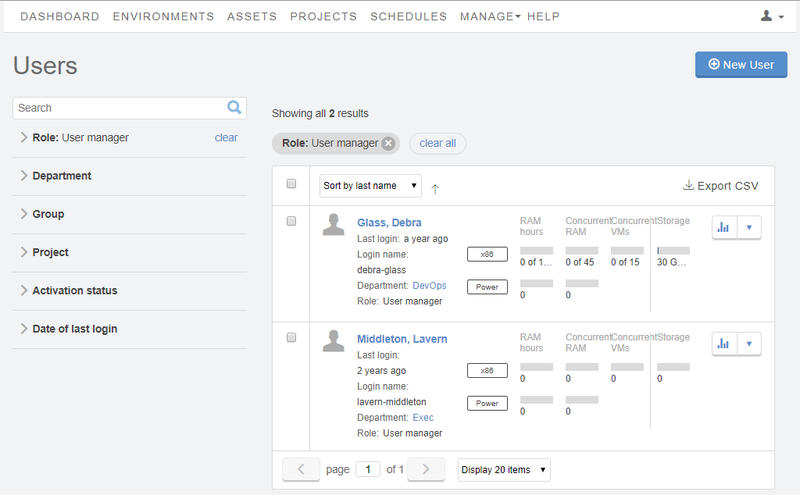 Assign the user to a department for usage tracking and management. For more information, see Managing departments. A User role. For a description of each option, see User roles. (Optional) Enable or disable the user’s permission to access public templates and assets, import VMs, export VMs, and more. For more information, see Additional user permissions. Skytap sends an activation link to the user’s email address. The user must click the activation link to validate the email address and activate the account. If Browser activation is enabled, the link also activates the user’s browser. Bulk actions, like creating a large number of users, can be automated through the Skytap REST API. For example, the Skytap GitHub repository includes a sample Python script and CSV file for creating a large number of users during account setup. Thoroughly test any sample code before using it in your account.